Beach number two with wheelchair accessibility – Salt Pond Beach Park is near Hanapepe, and also has a Landeeze beach wheelchair. The lifeguards here are less familiar with the chair and had to dig it out from under a bunch of stuff, so I guess it’s not used very often. It’s kind of busted up (missing one armrest) but still works. Like Poipu Beach, this is a calm crescent beach inside a protective reef. 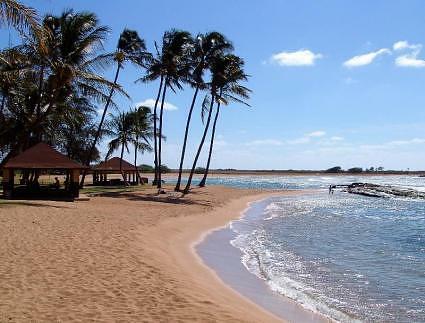 It’s larger than Poipu Beach, with a gentler slope down to the water, and the bottom is sandier. The water is murky here – no watching the brilliant fish and turtles.